You are getting new carpet installed and you’ve done your research online, talked to your friends who have recently bought carpet, shopped and selected. Your new carpet is going to look great and there’s nothing left to do but wait for the installers, right? Actually, there’s something else we at the Carpet and Rug Institute would like you to consider; the cushion. Carpet cushion – also called padding or underlayment. The stuff you see on the day of installation and never look at again until that distant future day when you redecorate once more. It is easy to overlook the importance of carpet cushion. A lot of what we love about carpet is enhanced by the right cushion. When you shopped for carpet, did your retailer offer you an “installed” price – the cost per square foot to get the carpet from the store to down on your floor? Many retailers do, and it’s usually a good deal. But remember, the cushion is included in that cost, and before you say yes to the package deal, why not ask a few questions about what cushion is included? Do you like a soft or a firmer feel underfoot? Do you have pets? If so, you might want a moisture-resistant or odor neutralizing cushion. Or one made with a percentage of recycled content – there are products on the market with a small amount all the way up to 100% recycled content. It may be worth a little extra per square foot to get the product that’s best for you. 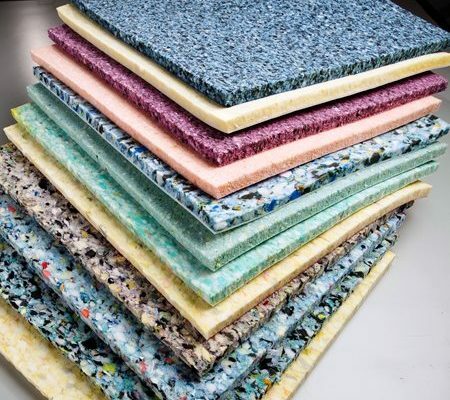 One of the most important considerations when you shop for cushion is to look for The Carpet and Rug Institute’s Green Label or Green Label Plus certification on the cushion product. Both the original Green Label and more comprehensive Green Label Plus Indoor Air Quality testing programs identify products with low emissions of volatile organic compounds. The green and white Green Label or Green Label Plus emblem on a carpet cushion display means you are choosing a product with the lowest VOC emissions on the market. More information from the Carpet Cushion Council about the importance of installing the correct carpet cushion. There’s a lot to think about when you are selecting new carpet, but once you have just the right color, texture or pattern picked out, spend a few minutes thinking about pad – chances are, you will be glad you did.